Men's shell necklaces make a wonderful casual fashion accessory that is usually paired with informal warm weather clothing. But you don't have to be on a beach on a sunny day to enjoy the beauty of an eye-catching shell necklace. Throughout history shell necklaces have been worn by men. 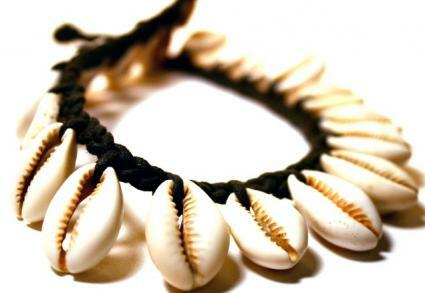 For example, in the Southern hemisphere the shell necklaces worn by men on most of the islands were not only considered decorative body jewelry, they also indicated the particular group or tribe the men belonged to. The shells on the necklaces also had religious significance distinguishing the healer of the village from the rest of the community. There is a wide selection of shell necklaces available for men today. The many styles and shell designs, combined with the vast assortment of shell choices, results in shell necklaces that are strikingly attractive. The most popular shell necklace for men is made from puka shell chips. These beautiful white shell necklaces can be custom made in lengths from 13 to 25 inches at Dandl Creations and are priced between $5.25 - $7.50. Other beautiful puka shell necklaces for men are made of tiger, dyed blue denim, brown and orange puka shells. The types and colors of shells can be varied in a custom-made necklaces creating beautiful designs and color patterns. Cowrie shells make an excellent choice for a man's necklace. The shells can be strung on the necklace in a vertical or horizontal pattern which gives the necklace a completely different look. Often cowrie shells are combined with hemp to create a casual and striking design. Africa Imports has a wide variety of cowrie shell necklaces. Hammer shells necklaces are generally made of small chips that can be left natural in various uneven shapes or rounded for a smooth even finish. The hammer shells are often dyed to create necklaces in striking color combinations. Sarah's Creations offers a handsome hammer shell necklace that is 17.5 inches long. Men's shell necklaces once thought of as an item of jewelry limited to tropical islands, surfers and sunny beaches have now earned their rightful place in the jewelry world as a fashion accessory to be worn and enjoyed by men all over the world.